Located on the banks of the Tunga river, Shimoga now officially renamed “Shivamogga” is a gateway to a number of unknown yet beautiful destinations. 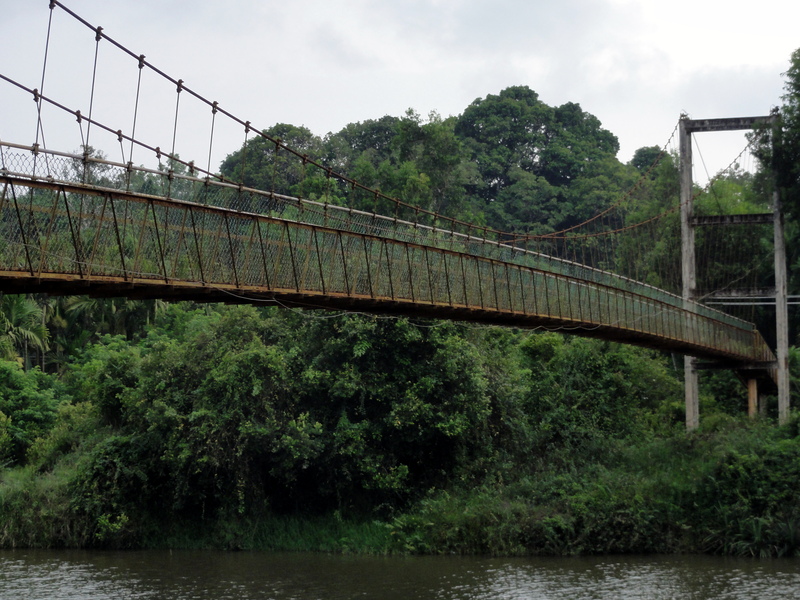 Also called the “Gateway of Malnad”, the city lies at a distance of about 300 kms from Bangalore. We explored a number of ‘untraveled’ destinations last summer from the city as a base. Our first stop was Kuppali which is the hometown of great poet Kuppali Venkatappa Puttappa popularly known as Kuvempu. Nestled in the beautiful confines of the Malnad region, this otherwise sleepy town is now famous for the “Kavimane” as well as the “Kavishaila”. “Kavimane” as the word translates is the ancestral three storeyed home of Kuvempu which is now converted to a museum. It is extremely well maintained and provides a great insight into the “Thotti mane” style of architecture popular in those days. The antique pieces of furniture, vintage storage boxes, wooden cradles, utensils and kitchen aids of the yesteryears like the giant “kadigolu” (used for preparing buttermilk) among others are nothing short but fascinating. 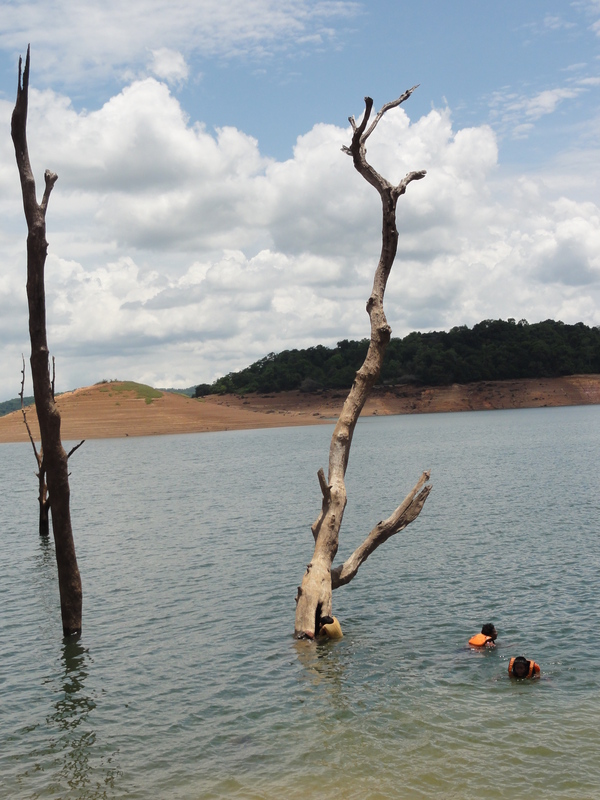 Kavishale is another site significant to the life of Kuvempu. At a short distance from Kavimane, this is a serene open area with rocks arranged in a fashion that is reminiscent of the beautiful Stonehenge in England. “Dhyanapeeta” where Kuvempu spent long hours weaving out his magical creations is truly inspirational. Kuvempu’s memorial lies in the centre of this site and this place is worth a visit. Moving on, our next stop was Chibbalegudde which a quaint town on the banks of the river Thunga. Located about 10 kms from Thirthahalli, this place is famous for the Sri Siddi Vinayaka temple which is small temple dedicated to Lord Ganapathi. Just behind the temple flows the Thunga river which is accessible by a small flight of stairs. 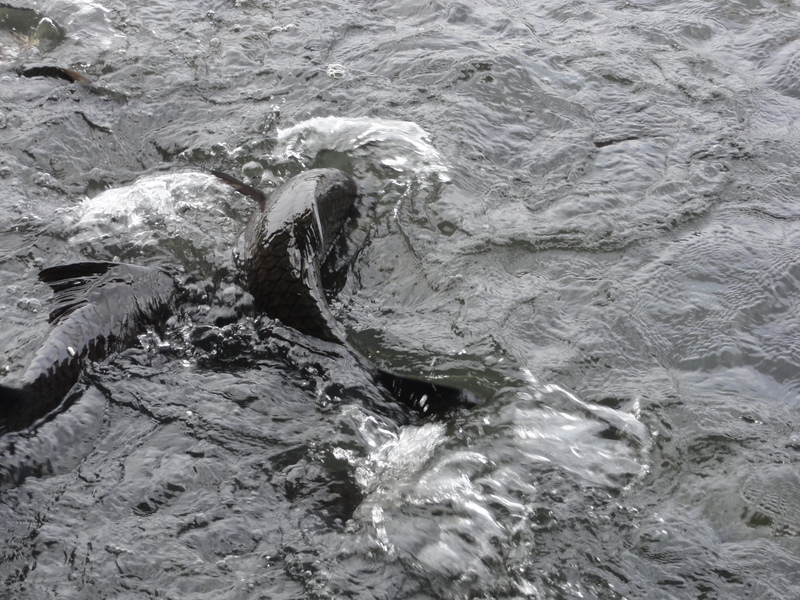 The river has scores of large fish similar to the ones seen in Srigeri and they feed on the food provided by the devotees. The fish coming close to the bank in huge numbers making ‘mini whirlpools’ as they grab the food is a treat to watch among kids and elders alike. Nestled in lush greenery among the hills with the serene water flowing in the centre, this place is a great place to unwind and rejuvenate. Bheemanakatte is yet another beautiful place to stop by. Located at a short driving distance of about 20 minutes from Thirthahalli towards Agumbe road, this town is also located on the banks of the Thunga. Legend has it that the Pandavas lived here during their exile and Bheema had constructed a bathing platform for there for Draupadi using rocks, hence the name “Bheemanakatte”. Though we did not find the “khatte”, we chanced upon a hanging bridge while driving through the interiors of the village. The bridge in the midst of the lap of nature with the tranquil water underneath is a picture of serenity. While it seemed the perfect picnic spot for us, the bridge is highly frequented by motorists as it connects Bheemanakatte to the adjacent town. Bheemanakatte has one of the Moola Mathas of Vaishnavas, namely the “Bheema Sethu Munivrinda Mutt”, where it is believed that Achuytha Preksha one of the main guru of Vaishnavas resided. Kundadri hill our next stop for the day was the beautiful hillock of Kundadri. It is in fact a hill station located 20 km from Thirthahalli. 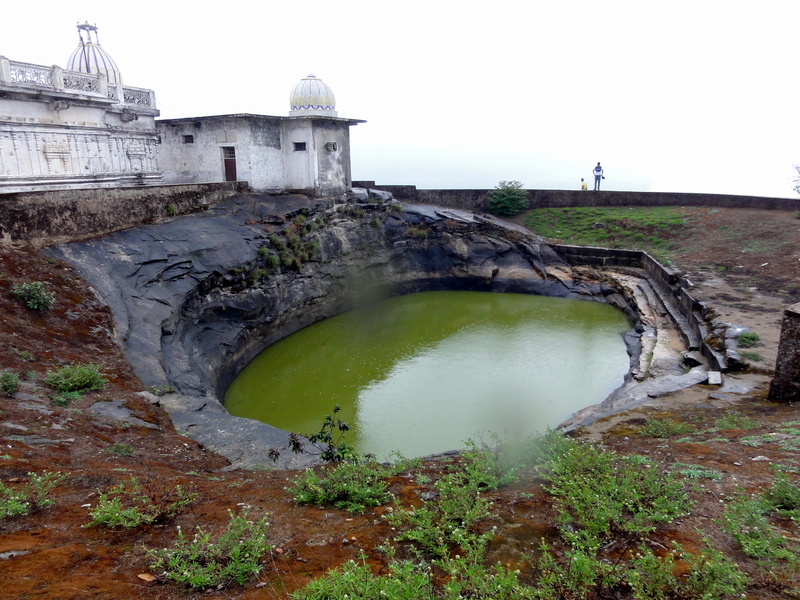 The hill is named after a Jain monk Kundakundacharya who is said to have performed severe penance here. It is a holy place for Jains and houses a magnificent temple on the summit. While there is a tar road, albeit narrow to the summit, the steep terrain also serves as a great trekking route for adventure enthusiasts. The beauty of the place can be best experienced on clear, sunny days when one can see the stunning view of the panorama from the top. The backwaters of the Varahi dam add to this picturesque setting and watching the sunset from the summit is nothing short of breathtaking. The next day was reserved for some ‘historical’ sightseeing and we decided to head towards Sagar and visit the fine temples of Ikkeri and Keladi. This region was ruled by the Nayaka dynasty in the post-medieval era who were once upon a time feudatories to the Vijayanagara Empire. We first visited the famous Rameshwara temple in Keladi which is one of the finest examples of the Nayaka style of architecture. Built by Chowdappa Nayaka, the temple complex encloses the shrines of Parvati, Rameshwara and Veerabhadra. The ceiling and pillars of the Parvati temple are made of carved wood, the pattern on the ceiling in particular is exquisite and includes a pattern of several unique flowers no two which are the same. The Veerabhadra temple has the beautiful Vijayanagar-style pillars with carvings of horses and lions. The roof has some really unique sculptures including that of the “Navagrahas” (nine planets), “Nagamandala” (serpent motif) and the Gandaberunda, which is the mythical two-headed bird of Karnataka. 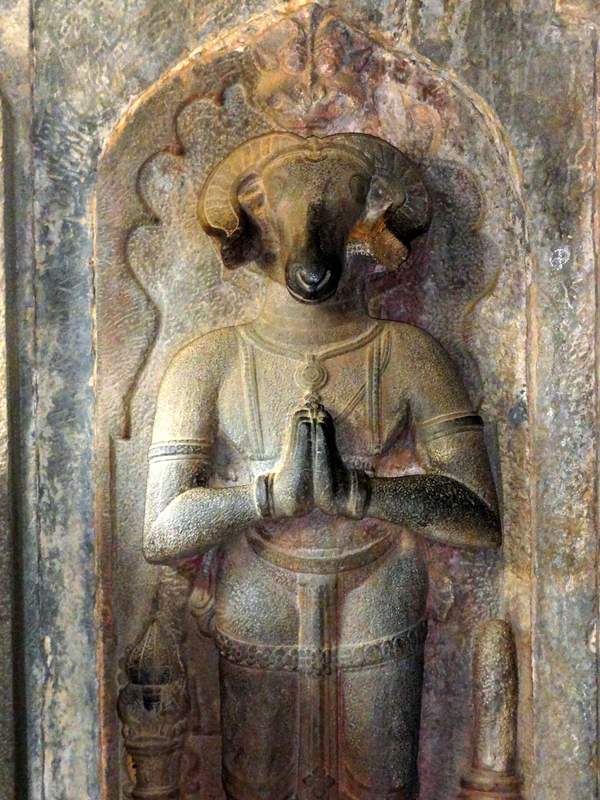 The statue of the Daksha Prajapati with his goat-head and the carving of the Vastu Purush or the God of structures are some of the really rare sights that can be seen here. 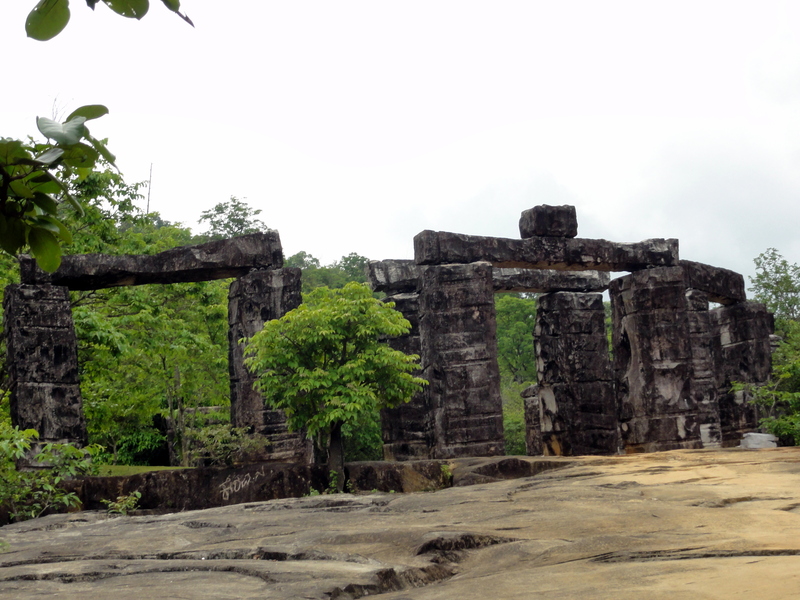 Per our guide, these structures are not seen anywhere else in Karnataka. 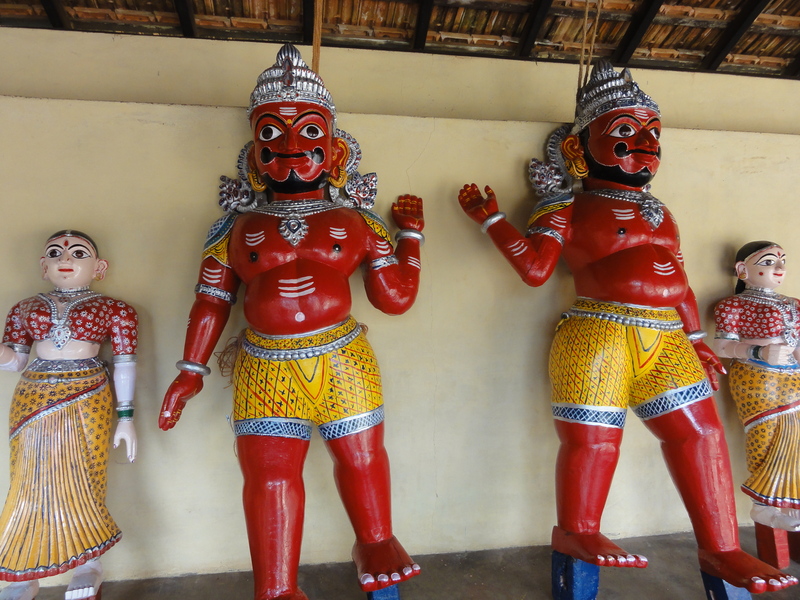 Close to the temple is the Keladi Museum and Historical research bureau which houses some rare artifacts and a rich collection of palm-leaf manuscripts reigning back to the Keladi Nayaka reign. Ikkeri, located at a distance of 6 Km from Sagar, was the capital of the Nayakas from 1560 to 1640 AD. The highlight of this place is the magnificent Aghoreshvara Temple, dedicated to Lord Shiva. This again is built in an architectural style that is a blend of the Dravida, Kadamba, Hoysala and Vijayanagara style. The temple itself built using granite, stands in the center of a vast rectangular compound and stands on a slightly higher ground. 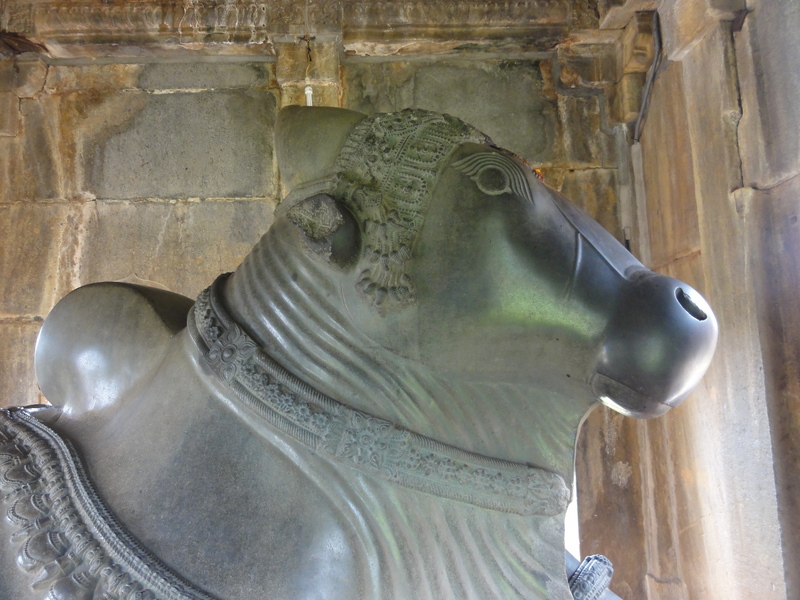 The first thing that strikes you as you enter is the resplendent Nandi statue in front of the temple with its impeccable finishing that is evident even today. The structure has a glazed glass like finish with a subtle sheen to its surface. The temple inside has a number of giant pillars with intricate carvings, the ceiling too is adorned with beautiful carvings. A large Shiva Linga is the main idol of worship and all along the walls of the main hall one can see intricate carvings of deities like Ganesha and Subramanya. Apart from the main temple, there is also a shrine dedicated to Goddess Akilandeshwari. The temple is a great place to devour a slice of the past and is now maintained by the Archaeological Survey of India. Located in close proximity to the temple is the “Varadamoola” which has a temple dedicated to Goddess Varadamba or Varadadevi. This place is the origin of the river Varada and hence named such. The river Varada flows through the Banavasi town before joining Tungabhadra River. Our next stop was Honnemaradu which is a marvel situated on the back waters of the Sharavati river. Tucked away in the interiors at a distance of 15 km from Sagar, this group of small islands are a haven for water sports and adventurists. The golden sands in the midst of the tranquil backwaters is nothing short of spectacular. With lush greenery and hills at the periphery, this is a great place to unwind and watch the sunrise and sunset. It is managed by a dedicated team of nature enthusiasts and we indulged in a coracle ride in the calm backwaters. We were given to understand that the place is equally beautiful post monsoon as most of the islands are submerged with all the greenery of the Western Ghats sporting a rejuvenated look. It was truly a great journey full of pleasant surprises and great revelations. The Malanad region in the lap of nature with its swaying arecanut palms and vast paddy fields has a number of secret treasures indeed. If you are a food lover, the region is a great place to pick up some local specialties like honey, “Halsinakai Happala” (Jackfruit papad) and the famous “Appi midi” (tender mango) pickle in Sagar. Do you also have a passion for discovering places that are relatively “less traveled”? Do let me know; I’d love to hear from you. This article was published in Metro Life, Deccan Herald. You can access the article by clicking this link.